You and I understand the in between. Those times in life when we are not where we thought we’d be and not where we want to be with our goals, our aspirations, our plans. I’m there right now, transitioning from a wonderful life with my beloved dog, Ayrabelle, and waiting for a new pup to add fresh joy to my life. There’s both an awkward tension and a gleeful hope. The in between. Maybe you’re plodding through your own in between right now. Your children or grandchildren are graduating to the next level of school or birthing a career and you are in a bit of a holding pattern. We applaud our loved one’s milestones while placing a bit of a check on our emotions. We want them to launch . . . we want them to stay. The in between. Perhaps your present job is beyond draining or the company is taking another direction and you are left behind. You want a better work fit . . . you want the familiarity of your coworkers and paycheck. The in between. Maybe the medication and treatment are winding down, but you are still not back to your normal energy and activities. You want to be well . . . you want your “other” body back. The in between. I’m with you on this mysterious path of both daring to inch forward while choosing to expect and look for better times ahead. Through my recent heart-wrenching loss, I’m choosing to soak up the unexpected blessings in THIS DAY, yet letting myself hope for more incredible memories with a new furry companion. I know these times will come in a few months, so I’m learning to embrace the in between. Not always without tears and sadness, but with a solid trust that God is working the not-so-good and the in between for my ultimate good. 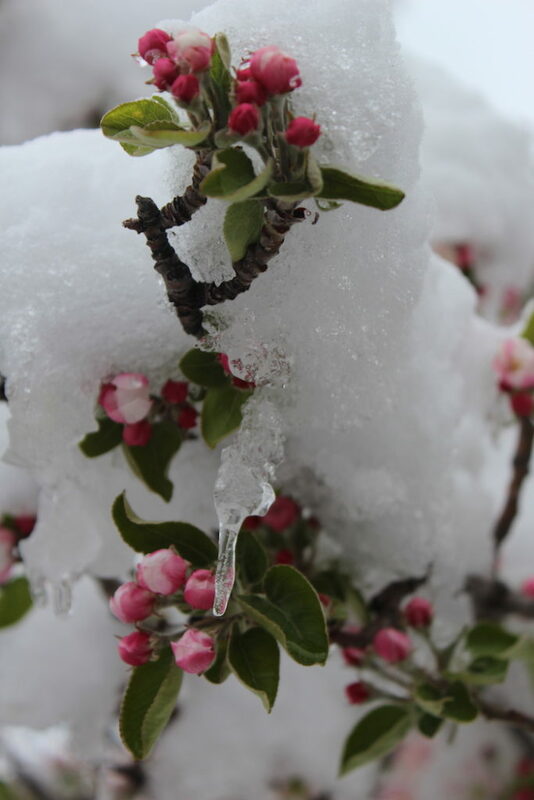 A few years ago I snapped this photo of my backyard apple tree stuck in a seasonal in between. Brrrrr and beauty all rolled into one as winter shook out its coat of snow and ice before letting spring bask in the spotlight. I wonder if today you are in your own seasonal in between. Like snow-covered apple blossoms, you are doing your best to hold steady while waiting for your next season, your next fresh start. Are you growing weary of waiting in the in between? Shhhh . . . can you hear the plop-plunk, plop-plunk of your in between melting into the “something new”? Are you getting a glimpse of that pathway opening up in your wilderness times? Look. Is that the beginning of a stream in your dried-up wasteland? Squint. Squint. I’m right with you, eager for our something new to be fully here. Shhhh . . . listen. Plop-plunk. Plop-plunk. Look. Squint. Squint. Beth, I always love your incredible perspective! Sandra, thank you for your faithful encouragement. You’re amazing!